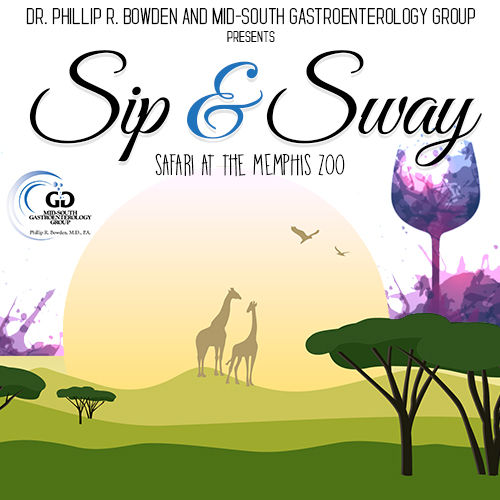 Join Dr. Phillip R. Bowden and The Mid-South Gastroenterology Group at the Memphis Zoo for The Sip and Sway Safari. It’s an amazing tasting experience of wines and liquors from around the world. Wine stewards and liquor experts will serve, educate and offer pairing suggestions for spirits ranging from French vodka to Napa Valley wines and everything in between. You will leave each station with a taste that is sure to delight your palate along with appetizing ideas on how to pair the best liquors and wines with any meal. Wines, Vodkas, Whiskeys, Bourbons and Rums will all be represented for your tasting pleasure. Indulge in delicious tapas provided by Fascinating Caterers and SWAY the night away to crowd moving Deejays and Live Music. If the tastings, education, pairings, food, DeeJay’s and live music in the most unique atmosphere in the city of Memphis isn't enough, you have the opportunity to upgrade the night with the purchase of an all-access admission ticket that includes Phil’s Pagoda where bartenders will thrill and excite with custom cocktails, enjoy the private tapas bar and dance to the awesome sounds of a private Deejay. All access tickets are limited. Sip and Sway Safari will be held at the Memphis Zoo on Saturday, June 29th, from 7p.m. to 10 p.m. General Admission tickets are $80 All Access tickets are $100. A portion of all proceeds will be benefit the Memphis Academy of Health Sciences.